Following the official roll out of its new Timeline, Facebook is introducing Actions, a series of new applications that change how people interact with apps, content, brands, and each other. The new apps will extend Mark Zuckerberg’s vision of frictionless experiences based on Facebook’s Open Graph platform, where apps introduce new ways to share your actions with your friends either implicitly or explicitly. With the new Open Graph platform, developers will introduce new Actions and Action buttons that extend the functionality of sharing beyond Likes to now include a dictionary of suggestive words such as “Want,” “Own,” “Read,” etc. As Facebook states, “Apps bring your Timeline to life.” Two of the first frictionless Timeline apps I experimented with were Spotify and the Washington Post Reader. These apps, with my approval upon installation, automatically sent updates that share with friends what I was listening to or reading. For example, “Brian Solis is listening to ‘Love will tear us apart’ on Spotify” or “Brian Solis is reading ‘Talking with Aung San Suu Kyi’ on Washington Post Reader.” These updates are designed to pique curiosity and motivate people to either click through to the source and ultimately, install the app for themselves. With the new Open Graph platform, Facebook is going live with over 60 Timeline App partners including, Ticketmaster, Pinterest, Rotten Tomatoes, RunKeeper, among others. These apps will extend the interests, activities, and accomplishments of people beyond the moment, to create a more engaged ecosystem around you and your interests. The Achilles Heel of any social network is the state of engagement among users. In-network sharing and interaction combined with external integration between outside sites, Facebook, and the people who share and engage, are critical to the sustenance and growth any network, especially one that is approaching one billion users. The Like button is far too limiting to fuel ongoing discovery and interaction in a maturing social economy. Expectations grow as complacency perpetually looms. Frictionless experiences are merely the beginning. Facebook is empowering developers to think beyond the Like button. Yes, you read that correctly. Actions are now going to open up a new genre of buttons that share your accomplishments and desires with your network. Initially, developers will introduce action buttons on their Websites to alert friends to a greater variety of interests and achievements. In the example below, you can see how Recipe Box is experimenting with two words, “Cooked” and “Want.” Clicking either one connects the Website with Facebook, distributing the action, intention and the destination to the Timeline, News Feed and Ticker. Before, a visitor would simply “Like” the recipe, which might invite a reaction back on Facebook. Certainly, it would require a much more manual approach for someone sharing it to say, “I want to try this.” Now it’s as easy a clicking a button. As a developer or as a brand manager or marketer, this is your time to rethink not only web design, but the entire click path and experience. It’s not just the button that will trigger shares, it is the page, the design, the words, and consideration of the psychology of sharing. Why would someone want to take this click to action? What will the thread of engagement look like? Those who think it through will find greater engagement, reach, and ultimately adoption of the app. Here are additional insights into the Open Graph platform for developers. Facebook’s Open Graph invests in what I refer to as the Egosystem, a network in which each person is at the center of their own universe. Each app now extends the persona of each individual, where they tell their story through updates and actions and tailor engagement based on what they do and say. 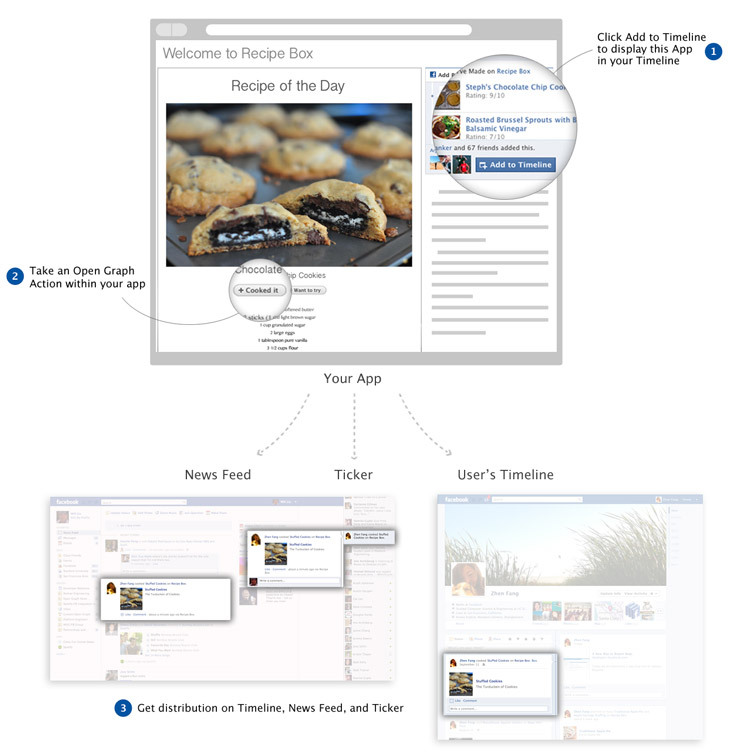 Facebook is simplifying the sharing process for doing so. The idea is that we strengthen relationships through interests and foster conversations based on our actions and intentions. As such, Facebook is investing in the quality of our relationships through technology where the social graph, people we know, slowly transforms into an interest graph, people with whom we share common interests. Surely our timelines will be riddled with irrelevant updates for a short while until we are compelled to experiment with filters. Of course privacy concerns will one again percolate as people learn how to master their settings. There is physical work required in the migration from social to interest graphs. But, the reward is an improved Timeline, Ticker, and News Feed that matters to you and those who orbit your Egosystem. Here are some tips to get you started via AllFacebook. A thoughtful approach inspires meaningful interaction. This comes down to what I refer to as A.R.T. of engagement, it must prompt Actions, Reactions, or Transactions. Each contribute to the quality and caliber of engagement and when designed accordingly, encourages people to share experiences that foster productivity. These should be viewed as pillars for application development. The goal isn’t to trigger frictionless updates. The objective is to inspire noteworthy responses and experiences…or significant actions, reactions and transactions. Think about this for a moment. Facebook and social media in general is powered by shared experiences. The Open Graph is an invitation to develop applications that stimulate engagement and can and should influence outcomes. This is only the beginning however. The Open Graph will increase and improve discovery and interaction. Over time, it will also help users refine relationships and the interactions between them. I have to say with all puns intended, I do like Facebook’s new direction. It’s very clever on the part of Facebook. They are becoming more of an aggregator so that apps that otherwise would compete for attention actually connect right in with the Facebook experience. Pinterest, for example, is incredibly addicting and is a very captivating social venue in its own right. Facebook thwarts the diversion of interest from Facebook to Pinterest by partnering and integrating the app. My concern with all of the updates Facebook is implementing is the overwhelm factor. People have flocked to Facebook because of how accessible it is. Now you have a part time job just to manage your personal page, let alone your business page. This is a fantastic, well-written and very thought provoking post, Brian. I very much agree with you concerning FB’s newest implementations overwhelming users. What do you think will happen once FB goes public? When Walls St. looks for big returns – how much influence will the Goldman’s/Morgan Stanley’s have in terms of driving partnerships & integrations schemes? How will they effect the consumers, game players, social networkers? Will these new business models brought to you by Wall St. (the 1 percenters) result in impacting this social darwinian experience much like a meteor strike or volcano? Will there be mass extinction to the point that all these social networking visions, ideas, products, and evangelist become homegenized? Brian, there is a major risk though for Facebook. You note “The Achilles Heel of any social network is the state of engagement among users.” If variations of Likes create a vast array of new frictionless sharing (Cooked! Skimmed! Oogled! ), the supply of broadcast sharing will exceed demand to read it all — and Likes and their ilk will become devalued. We’re less likely to engage with Facebook if the utility of the content there falls, just as I rarely check Gmail anymore due to the vast array of unwanted spam there. Big supply + static demand = lower prices. Big Likes + static demand = reduced utility of a social media network.We’ve seen this communication devaluation before. CPMs and ad impression-based metrics have been caught in a downward spiral of value for decades, and social-media sharing could enter the same thing. The irony is the social media gurus who proclaim “the CPM is dead” miss the nuance; CPM exists, but it’s worth a lot less. Social media metrics are about to go the same way.If Facebook makes it easier to engage, with engagement really meaning “broadcast your Ego to others in as many new ways as possible,” the question is will recipients change the channel? An impressive list of ‘Action’ applications. It’s interesting to speculate on who Facebook will include in their open graph and how much of the rest of the web will be left in the ether. No music deals aside from Summify… My favorite new community for discovering music is ThisIsMyJam – but it’s powered by YouTube so it won’t be included? How do think this “Action” list and the news that Facebook is trying to buy Vivo tie together? Will Dailymotion and Metacafe be the next YouTube? Pingback: HR Margo Rose HireFriday Boot Camp 2.0 » Blog Archive » Facebook Lovers, and Haters-The Open Graph Is Here! Here’s How To Make The Most Of It. Great article. Extremely detailed and well thought out. I love how you point out reasons for why you like the new system for the way it engages new ways to communicate with one another and ability to make the company share experiences better. You are totally on the money and I agree with you analysis of what you think Facebook is trying to do with the new system. The way users are engaging with one another is changing and I believe it is for the better as well. Timeline lets us go back and view our past relationships with people and remember things they said in the past for future reference. Is it a little creepy? Perhaps. But interesting never the less. Nice post, Brian, but I do have one question: don’t you think the “frictionless sharing” will end up in automated meaningless sharing? Also, the noise levels will be staggering, even if we develop good filters. I’d like to know your opinion on this particular issue. Thanks. Nice post, its company’s fast growth of influential activities are incredible from the past few years and now this?? I can’t imagine how many percent of FB’s profit will increase after the next 5 years.